Neighbors | Jessica Harker.Fifth- and sixth-grade bands performed at Austintown Middle School's annual holiday concert on Dec. 19 at Austintown Fitch Auditorium. Neighbors | Jessica Harker.Austintown Middle School Band Director Jeremy McClaine directed the fifth-grade band for their first performance at the school's annual holiday concert on Dec. 19. 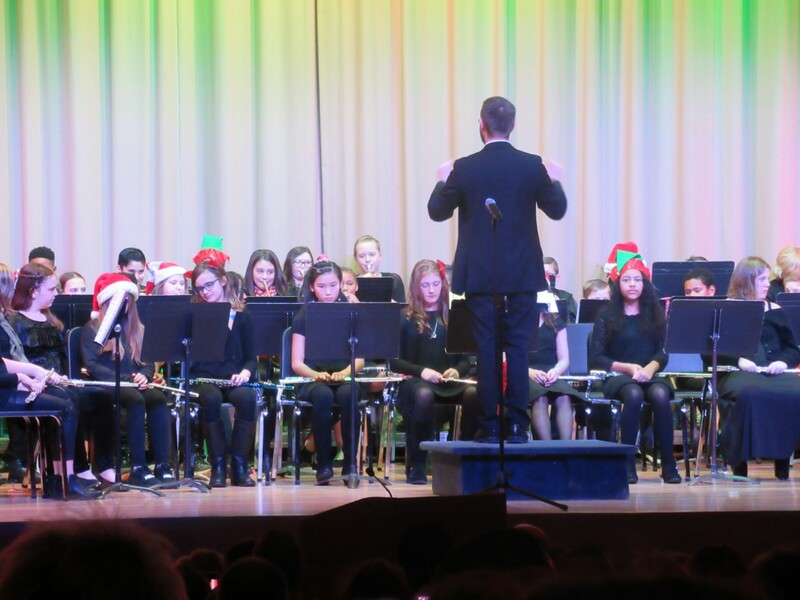 Neighbors | Jessica Harker.Jeremy McClaine, Austintown Middle School band director, spoke to the crowd gathered at the Austintown Fitch High School auditorium for the school's annual holiday concert. Austintown’s fifth- and sixth-grade bands performed their annual holiday concert on Dec. 19 at Austintown Fitch High School. Fifth-graders played pieces of 13 songs, including “Hot Crossed Buns” and “Jingle Bells”. Sixth-graders are in their second year of instruction, playing four full songs for audience members. Mortimer, along with band director Jeremy McClaine, instructed students throughout the year in preparation for the program. Mortimer said that this is the first time that fifth-grade students have performed for an audience, having started learning their instruments in late September, early October. “Most students have never performed on stage so many students came up to me expressing how nervous they were to have an audience to perform for,” Mortimer said. She said that students start with a Jump Start program, where the school brings in an instructor who specializes in a specific instrument to work on basics with students for a week. After the first week, Mortimer said she instructs the woodwinds and McClaine works with the brass, coming together as a full band for the first time in December. “Overall, the students were so excited to show off what they have learned so far,” Mortimer said. The fifth-grade band consisted of 120 students, with 80 in the sixth-grade. The fifth- and sixth-grade bands will play again in 2019, with the band’s spaghetti dinner on Feb. 23 and the spring concert on May 23.